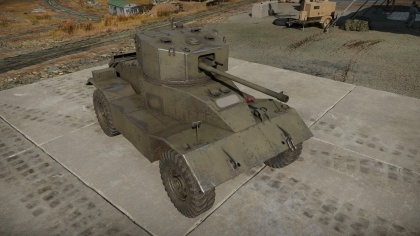 The AEC Mk.II is a gift Rank II British light tank with a battle rating of 3.0 (AB/RB/SB). It was introduced during Update 1.75 "La Résistance" in the 2017 "Festive Quest" that took place between 22 December 2017 to 22 January 2018. It was obtained via completing 7 tanker's Christmas toys. The AEC Mk. II looks fairly similar to the Armored Car Mk.II AA, mostly because it is, just with a different turret housing a 57 mm 6-Pounder cannon, rather than two synchronized Oerlikon 20 mm Anti-Aircraft cannons. As such, the vehicle has a lower profile than its predecessor, which grants it more stealth capabilities. In addition, there is a 7.62 mm BESA machine gun for use, which is nice for dealing with lightly armoured targets such as open-topped Anti-Aircraft vehicles and SPGs. Wheels are 2 mm thick. Chassis is 5 mm thick. The AEC Mk. II is to played mainly in the role of flanking and reconnaissance. Due to the high speed and thin armour, it is ill advised to use this vehicle in frontal assaults. Added to the new mechanic of active scouting for light tanks, it is rewarding to be an effective scout by highlighting targets for allies, thus farming SP and experience from their assistance. However, the AEC aren't as small as a scout like the American M22 Locust, so scouting and flanking can be risky if done incorrectly. That being said, the AEC also have the same 6-Pounder cannon found on the Crusader Mk III, Churchill Mk III, Cromwell Mk I and the Valentine Mk IX, so the AEC has a fast rate-of-fire with an excellent muzzle velocity. Here are some methods for maximizing not only combat effectiveness, but also the chances of surviving. The first method of using this vehicle is for reconnaissance. Since the addition of the "active scouting" mechanic, light tanks have the ability to report the position of enemy vehicles to allies. When fulfilling the role of scouting in this vehicle, find a position that is concealed, but that gives a clear view sight of the battlefield. This is most helpful for farming Spawn Points and experience given that when an allied vehicle destroys an enemy player being actively scouted, granting a 50% reward of what the allied player was awarded. This can work best when paired with allied tank destroyers for dislodging stubborn enemy defenders holding down key positions. The second method of using this vehicle is flanking. When using this as a flanker, try to use the terrain for the advantage and end up on the enemy's flank. Coupled with the AEC's fast speed, it shouldn't be too difficult to get up to speed if the terrain is favorable, as muddy terrain will severely inhibit the ability to maneuver. After all, the AEC is still a wheeled vehicle, so don't expect to speed over all terrains as in a tank. Nonetheless, when on the enemy's flank, ensure that it is a spot that isn't as exposed as others. Then, start pumping shots into the sides of the enemy tanks. It is highly recommended to fire a few shots then relocate, thus preventing the enemy from triangulating the AEC's firing location. It doesn't hurt to use "active scouting" as well, to notify allies of an incoming enemy armour movement. With very light armour, this renders the AEC vehicle highly exposed to any form of enemy fire except machine gun fire. However, at the Battle-Rating of 3.0, there are some adversaries that deserve special note. The AEC's greatest adversary is most likely the Panzer IV F2, due to its long-barreled 75 mm cannon, which can punch right through the armour- even from long range. In addition, any later model of the Panzer III is going to give severe problems due to their long-barreled 50 mm cannon, which has a rapid rate-of-fire. As laughable as it sounds, the Flakpanzer I and the Gepard will also shred the AEC, as a result of their ability to use the HVAP-T round for their 20 mm cannnons, which have a murderous rate-of-fire. In Battle-Rating 3.3 matches, stay away from a Flakpanzer Wirbelwind at all costs, as the shear volume of their fire will utterly obliterate the AEC, even if they do not have the HVAP-T round. The most dangerous opponent in respect to the AEC is the Sd.Kfz.234/2 "Puma," due to its amazing speed and a high-velocity 50 mm cannon. The Marder series will also give issues, due to their high-velocity cannons. The Soviets have the most tanks with heavy armour, which can make it difficult for even for the 6-Pounder to punch through. That being said, a KV-1 is going to give a lot of problems, even at close ranges. In addition to that, the most abundant Soviet threat is going to be the T-34, due to its fast speed and sloping armour, which has the chances to bounce a shell, even at close range, if the tank is angled well enough. The most dangerous opponent is the SU-122, due to the 122 mm howitzer it carries, which doesn't need to make a direct hit if firing High-Explosive shells. In addition, the 29-K boasts a high-velocity 76 mm cannon, which will tear through the AEC's armour even at long ranges. Japanese vehicles may not have the strongest armour for their tanks, but their guns will make anyone think twice. Most notable of these is the Chi-Nu and the Ho-Ni III, which have high-velocity 75 mm cannons, which will rip through most armour at medium to long range. 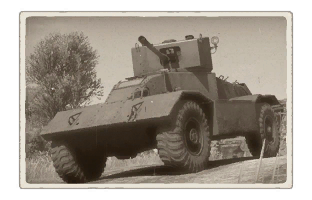 The So-Ki SPAA can also rip through the AEC due to the twin 25 mm cannons. In addition, the M24 Chaffee (Self-Defense Force) boasts a 75 mm cannon and a .50 Caliber machine gun, which can bore through the thin armour. The French also have some vehicles that are heavily armoured. Most notable of them being the Char B1 bis and the Char B1 ter. The Char B1 ter is probably most notable of them, due to the ridiculous amount of armour from the front. The SAu 40 is a viable threat, thanks to its 75 mm cannon. It is also plausible to face the French M4A1 Sherman, which not only has enough armour to possibly bounce the 6-pdr shells, but a 75 mm cannon and a .50 Caliber machine gun, which is notorious for tearing through just about any lightly-armoured vehicle. It is also important to note that the GMC CCKW (40 mm Bofors AA truck) is a major threat to the AEC, due to the Bofors 40 mm heavy Anti-Aircraft cannon it wields. Same powerful 57 mm as on the Churchill Mk.III- high penetration and excellent fragmentation. Excellent 12 degrees of gun depression. Very mobile, especially on hard surfaces. At 87km/h it is one of the fastest vehicles in game. Turret has decent armour for an armoured car, can take some hits from auto cannons and low rank guns. Weak armour can sometimes be over penetrated. 7.52 mm BESA machine gun has a superb rate-of-fire and is effective against open-topped vehicles. Hull armour, though well sloped, 20 mm autocannons and above will penetrate it. Cross country performance is not as good as tracked vehicles. Gets bogged down easily in mud. Cannot turn on the spot. Only three crew members, a hit center mass will take the AEC out instantly. Aircraft with cannons are a threat. The AEC Mk.II has only been available so far in the 2017 "Festive Quest" that took place between 22 December 2017 to 22 January 2018. It was obtained via completing 7 tanker's Christmas toys. This page was last edited on 13 January 2019, at 18:12.